I'm back with more cards featuring the Circle Shaped Shaker Set. For my first card today, I’m sharing a shaker, but for my second card, I’m sharing a little twist on the fun dies included in this set. Here we go! 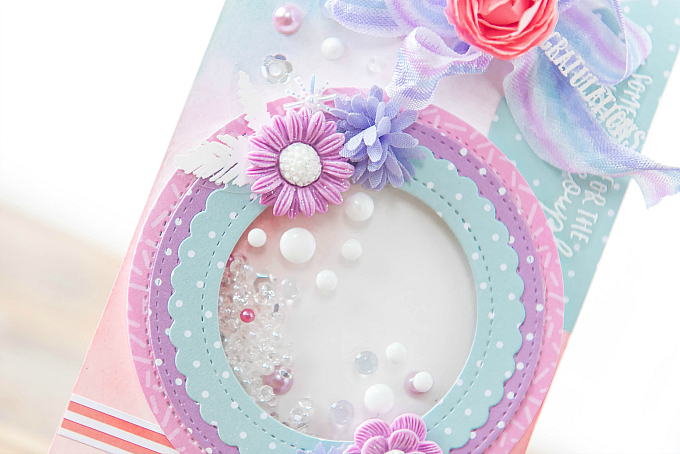 First up, I wanted to take this beautiful shaker that features all three layers of circles, and really dress it up, so I added swirls of blended ink and heat-embossed sentiments to the base of the card. The pretty sentiments are included in the kit, and I used colors of PTI's Aqua Mist and Distress Oxide Abandoned Coral for the blending. For the shaker I used paper from the Dots pad and Birthday Bash pad. I added a lot of sparkly bits and bobbles inside and outside the shaker, including pearls, rhinestones, and Diamond Toppings, as well as pretty dots all over the shaker itself. 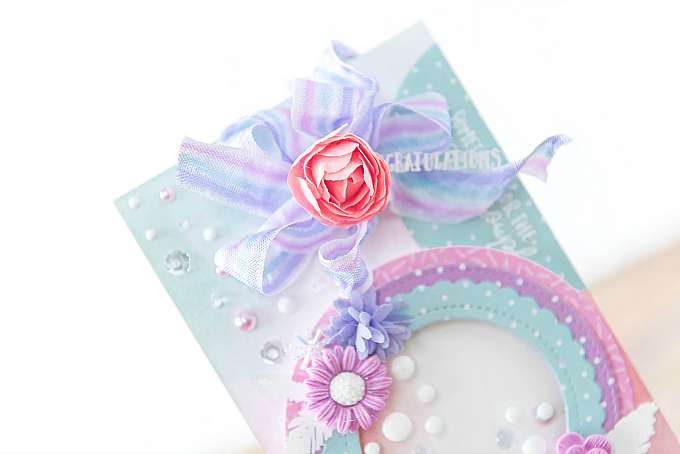 I added a touch of striped ribbon and some flowers to the card for a romantic twist. I used Queen and Company Pom Flowers and Glitter Flowers in Purple. I also added sweet little Nuvo drops on the acetate shaker and a few leaves using 1Canoe2 Twilight stamps, heat-embossed on vellum. 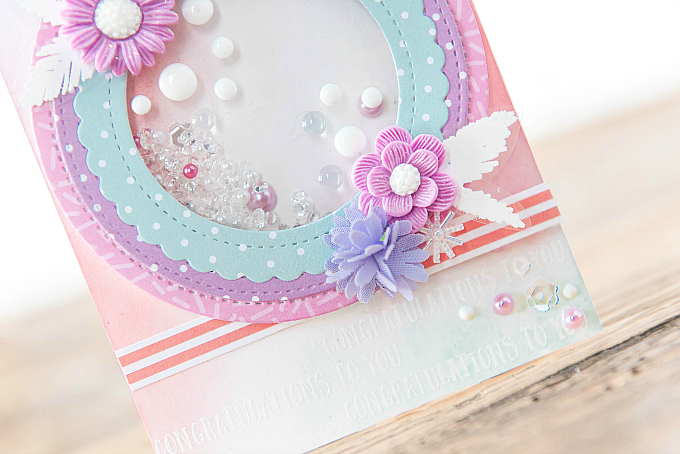 For my next card, I pared back the layers, and challenged myself to use the shaker dies in a different way! 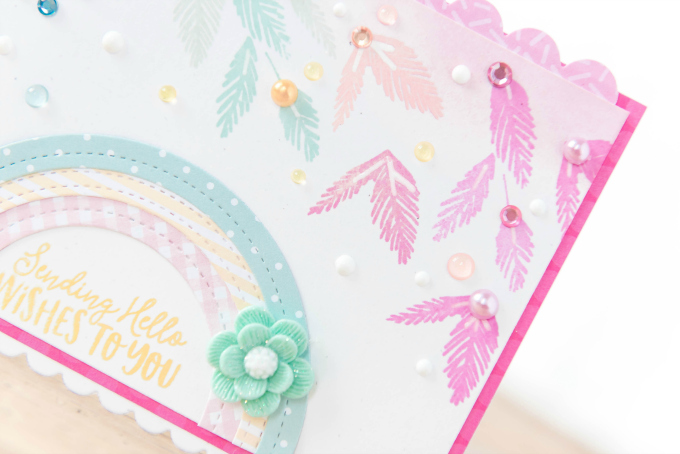 So I came up with a wee rainbow, cut using the circle dies, out of pretty Queen and Co paper patterns - the Flirty Florals, Dots, and Stripes paper pads. I matted the card onto some sweet paper from the Dots Paper Pad collection, along with a scalloped edge on both the top and bottom. I once again pulled out my 1canoe2 Twilight stamp set, and stamped a spray of leaves at the top of the card in pretty Archival Ink colors of Magenta Hue, Tea Rose, Viridian, and Sap Green. 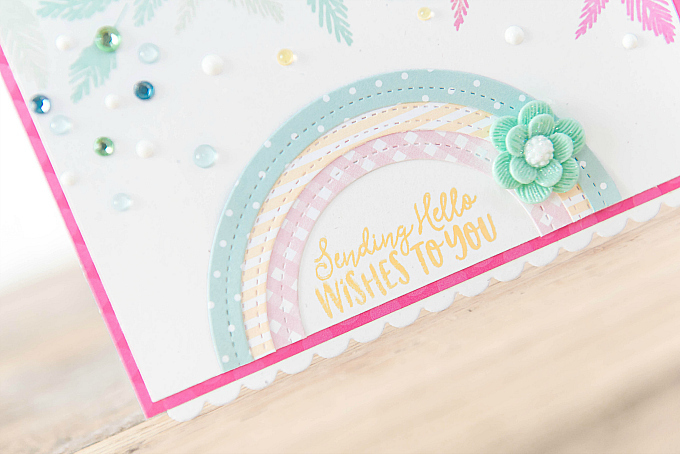 I added a sweet Glitter Flower to the rainbow, and a stamped sentiment using the little stamps included in the set with a dash of Buttercup Archival ink. Thanks for joining me, dear friends. Have a great day! I found your blog through my blog!! Thanks you so much for your kind words - they touched my soul! 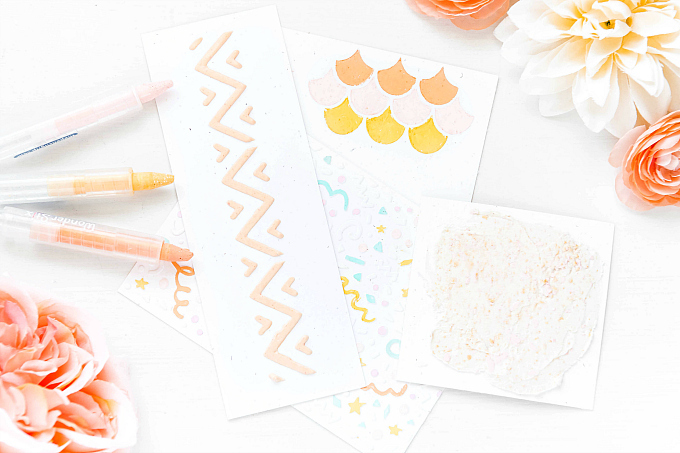 Your projects are just gorgeous on your blog as well! I'll be subscribing! Vicki, it's so nice to "meet" you! It was such a pleasure to visit your blog and so touching to read about your journey! Thanks so much for popping by and for your sweet words. Sending many crafty hugs! I love how feminine and sparkly your shaker is Ivana! The colors and flowers are extra pretty. But I have to say that your darling rainbow wins my heart, I'm smitten!! Lisa, me too! The rainbow came out of a pile of scraps that I simply couldn't resist! Thanks so much for your sweet support and kindness! Sending heaps of hugs! Oh no! I hope that's not a bad thing! :) And I hope you love your new goodies! ;) Thank you so much for your visits dear friend! This is STUNNING!! I LOVE how you used the shakers on this!!! Your colors are just so dreamy!! Modern, creative & beautiful, Ivana! I'm so very sorry I haven't been here in such a long time. It's not that I haven't been thinking of you, but I wanted to have time to see everything & really catch up. No idea why I'm constantly behind when I don't even work now!